Experience the many splendours of Peru's ancient past on this 16-day tour that takes you to famed sites and hidden gems. In northern Peru, discover traces of pre-Inca cultures, including the mountaintop fortified city of Kuelap, home to the Chachapoyas “Cloud Warriors;” and the eroded adobe ruins of Chan Chan. Round out your exploration of Peru’s fascinating past with an early morning guided visit to magnificent Machu Picchu. Board an early flight to Jaen, then travel overland to Chachapoyas, gateway to the archaeological sites of northern Peru. "Chacha," as it's known locally, will be our base for exploring the natural, cultural, and archaeological highlights of the region. This morning, get immersed in the culture and history of the Chachapoyan people at Kuelap, a fortified city made up of more than 400 circular buildings and complexes. Ride a cable car up to the site, thought to have been an important cultural center for these pre-Inca "Cloud Warriors." Enjoy lunch at a coffee farm and attend an exclusive lecture by a Chachapoyas expert. Later, try to spot some of the 130 bird species that live in the surrounding ecological reserve, including the spatula-tailed hummingbird. Hike through the cloud forest to Gocta waterfall, one of the world's tallest cascades, 771 meters (2,156 feet) high. Ancient legends that discouraged local community members from talking about the falls, which did not begin receiving visitors until 2005 and are still relatively unknown. Take in Gocta’s mesmerizing spray; then opt for a longer hike to its base, or enjoy a free afternoon. Today, drive to Chiclayo. This coastal town, founded in the 18th century, was once an important trade route between the coast and the jungle and is rich with archaeological sites and cultural history. Spend the rest of the day exploring the city on your own. Drive down the coast to colonial Trujillo, stopping along the way at the tomb of the Dama de Cao. Tour the site and hear about the mummy discovered here in 2006, thought to be the remains of the Lady of Cao, a high-ranking Moche ruler. In the afternoon, explore Trujillo to discover baroque churches and local markets. Visit the Temples of the Sun and the Moon. Later, enjoy a visit to Chan Chan, a UNESCO World Heritage site and the world's largest adobe city. The former capital of the Chimu people, Chan Chan covers 26 square kilometers (10 square miles) and was once home to about 50,000 people. Fly back to Lima this evening. Enjoy a free day to explore Lima's capital city. Continue exploring the Sacred Valley with a visit to the “Parque de la Papa” (“Potato Park”). An exclusive experience for Journeys travellers and part of G Adventures for Good, you'll walk through this rural community with a local guide to learn about potato cultivation, weaving, and the importance of both to Andean culture. Also, explore the Ollantaytambo and Pisac ruins and visit the G Adventures-supported Sacred Valley Community Restaurant in Huchuy Qosqo. Catch an early transfer to Ollantaytambo station and board the scenic train to Aguas Calientes with the option to visit the market. Explore historic Cusco with options to visit museums or go whitewater rafting, horseback riding, or mountain biking. This evening, take in a different view of the night sky at the Cusco Planetarium. Enjoy a presentation on the southern sky, contemporary astronomy, and the ancient Inca relationship with the cosmos. Check out the on-site museum and use their telescopes to admire the stars. Fly back to Lima and spend an afternoon in Peru's bustling capital. 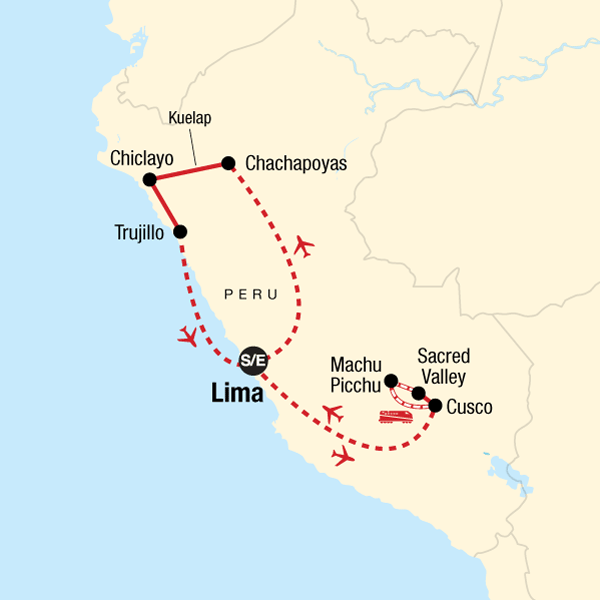 Those who have chosen the option in advance to hike the "1-day Inca Trail" will disembark the train at km 104 to begin the trek. The trail rises steeply up into the mountains and will take hikers past the archaeological sites of Wiñay Wayna and Inti Pata, where the local guide will provide insights into the fascinating culture of the Incas en route to the trek's culmination at the Sun Gate. Enjoy a packed lunch along the way and reach the Sun Gate in the late afternoon with a chance for a preliminary exploration of Machu Picchu before the guided tour on Day 5. Transfer by bus from Machu Picchu to Aguas Calientes to rejoin the group and spend the night in a hotel. If time permits, take an optional visit to the nearby hot springs to soak your sore muscles.